However, what some people most look forward to during Easter are the sweet foods and candies that come with the holiday. Cadbury Creme Eggs, Marshmallow Peeps, jellybeans, and chocolates of all sorts are only a few of the sugary foods that seem to be everywhere during the Easter holidays. While many people know that too many sweets can sabotage their diets, they may often forget that too many sugary treats can damage their teeth also. When you eat sweet or starchy foods, the bacteria in your mouth will use the sugar to create energy. As those bacteria burn energy, they produce very weak acids that can begin to erode the enamel of your teeth. The bacteria can form into a sticky layer on your teeth called plaque that must be removed by daily cleaning. The enamel is the hard, outer layer of your teeth, and it is made mostly of calcium. Enamel protects the softer under-layers of the tooth, called dentine, from damage. A cavity occurs when the acids created by the bacteria in your mouth eat a small hole in the tooth enamel. This leaves the soft dentine vulnerable to those acids and the bacteria that are present in the mouth. Protecting the tooth enamel from oral acids will help protect your teeth from cavities. The good news is this: With the proper approach, you can enjoy a few Easter sweets without damaging your oral or general health. So go ahead! You can have your cake, candy eggs, and chocolates and still have a beautiful smile for those Easter pictures by using these easy tips from Cardiff Dental. Cut back on hard and sticky candies. Toffees and hard candies are everywhere on Easter, and they are terrible for your teeth. First, they can pull out fillings as well as getting stuck between your teeth so aren’t ideal Easter treats! These sugars aren’t easily rinsed away either, meaning that the sugars present within them have longer to wear down your enamel. Brush and floss! We know, what are the odds a dentist would suggest this? Even if you rinse with water, make sure to brush your teeth after indulging in your Easter candy – BUT, wait about a half an hour before doing so. Eating temporarily weakens the enamel, and it takes about 30 minutes for saliva to restore your tooth enamel to its strong state. Some studies suggest that you should brush just before eating candy, as this may strengthen your tooth enamel before sugar has a chance to affect it. Go dark (chocolate, that is!). If you’re going to eat sweets, choose chocolate with at least 70% cocoa. This chocolate normally contains less sugar than milk chocolate. Some research has also found that dark chocolate contains antioxidants, which may have an anti-bacterial effect on the build of plaque as well as flavonoids, which may support gum health. However, remember that dark chocolate still contains sugar, so you need to consume it carefully and follow appropriate dental hygiene after eating. Choose non-candy based gifts for children. Candy seems to be the default gift for Easter. But there’s nothing to say it has to be this way. So, instead of filling an Easter basket to the brim with candy, consider toys and games, perhaps even books. These fill an Easter basket faster, are more fun, and last longer. Water is your friend for Easter and beyond. Serve water with candy, after candy, and during meals. Water sluices away food debris that works with mouth bacteria to build decay-causing acids. Serve water with Easter candy and encourage your kids to drink it as they eat chocolate bunnies and other sweets. Wait at least 30 minutes before instructing the children to brush their teeth to avoid brushing acids into tooth enamel. See your Cardiff Dental dentist. In addition to maintaining a routine of oral hygiene, be sure you have regular cleaning appointments scheduled with us. A professional teeth cleaning can clean off plaque (even in hard-to-reach areas), which can lead to tooth decay. So, if you or your children have finished your Easter candy, it’s probably time to make an appointment with us at Cardiff Dental. We’ll take a look at your teeth, clean them, and recommend any further appropriate treatment! At Cardiff Dental, we provide quality dental services for you and your family. Make sure to give us a call to schedule your appointment with us. Never spoil the Easter fun. 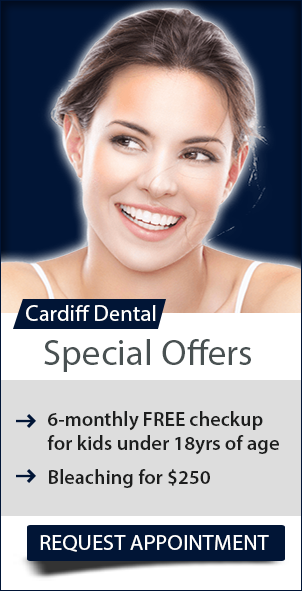 Visit your Cardiff dentist today! Contact us on (02) 4954 6888 or book your appointment online. We are located at 434B Kelton St in Cardiff.